Even though this practice is increasing in its popularity, many have misconceptions about what this is or what it’s good for. The most simple and truthful definition is this “Age regression is when somebody reverts to a child-like state of mind, often as a coping mechanism for things like PTSD, depression, anxiety, and other mental health issues.” And this meaning is what we are talking about today. Unfortunately for the sake of this post, there aren’t a lot of reputable sources for age regression, many of these sources get it wrong, and most places that even mention it mistakenly assume it is a sexual thing, when it is absolutely not. And that is why I wanted to write this article, to create a article that regressors can link back to and use to explain this to others, to end stigmas against regression and to stop the spread of misinformation. “Age Play and Age Regression are the same”- This is incorrect. Age Play is when someone pretends to be a younger age for a sexual reason. Age Regression is when someone feels like or goes into a younger head space for therapy/coping/stress relief reasons. The two are distinctly different but unfortunately get grouped together by ignorance. “Age Regression requires you to have a ‘Caregiver’”- This is also incorrect! You don’t need someone to be taking care of you in order to regress, because regression is based off you, your mental state and your coping mechanisms/therapeutic methods. “You must have had a bad childhood in order to age regress”- Actually, you can have had a perfectly normal childhood and still regress! For one, sometimes the traumas people are coping with happened later in life, so they’re regressing to cope with it now, other times for two, people regress for stress relief not necessarily to relive childhood! “You can only age regress if you’re mentally ill/Age regression is a mental illness”- Neither of these are true, as you can regress even if you’re neurotypical. Age regression is not a type of mental illness but is instead a coping strategy/therapy method/stress reliever. Now, I will share with you some people’s personal experiences with age regression to help them. Every story shared was shared willingly with us and we have kept certain people anonymous. The only thing changed in these stories is grammar/spelling. Everything else is left untouched. 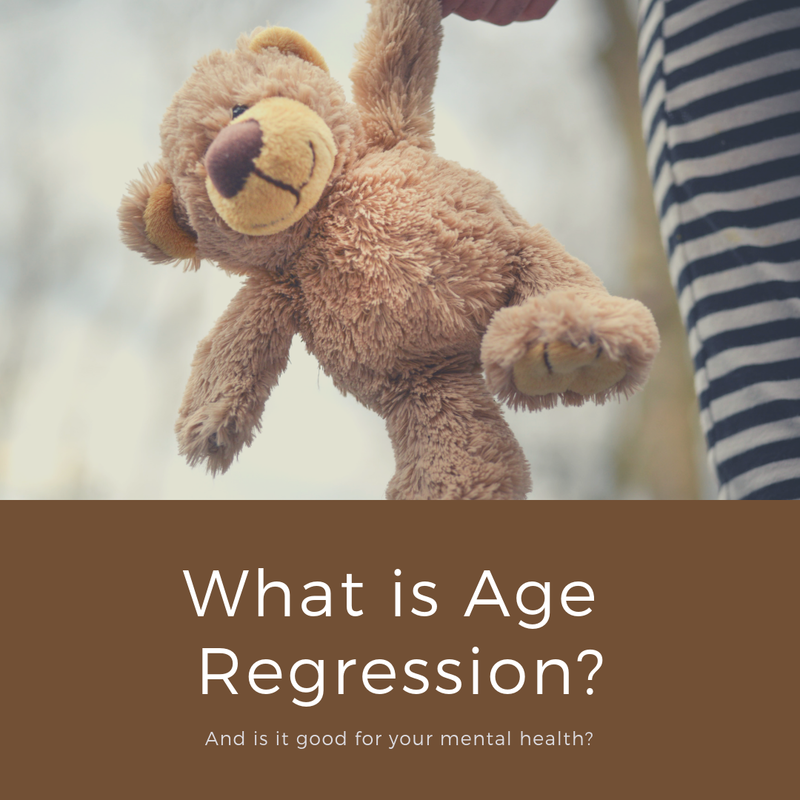 What do you think of Age Regression as a coping mechanism? Would you ever try it? Have you? Let us know what you think in the comments! One last note! Please do be cautious when using this coping skill. I have been informed that it is possible for this coping skill to cause dissociation. Please exercise caution and only do what you feel is comfortable and healthy for you. Thanks for reading! Remember to stay awesome, love yourself, and I'll see you in our next post! Thanks for sharing your experiences! People often use regression or tendencies of regression in various ways, one of which can be coping with social anxiety! Personally, I sometimes find regressing by accident in social situations can make me a little more timid, but it's really up to the person! Thanks for your comment! Thank you! Honestly, thank you so so much for this article! It is so hard to find someone who knows what regression is, and I ALWAYS searched for a cute blog where I was feeling comfortable! I finally found it!!! Thank you so so so much for your work!!! I'm actually doing a paper for my English class on age regression, mainly because I'm a little and I want to be able to better explain to friends who want to know what being a little means. Thank you so much for writing this article, as it helped tremendously. Thank you for reading! I hope your paper went well! You are very welcome! I am so glad you can now feel valid! You are so valid! I myself am an age regressor. I'm in highschool right now , so it's hard to use it when I really need it which is a bummer. I regress to the mindset of a 2 year old typically because that's the only age that I don't remember there being trauma. I still have a lot of work to do before I've recovered, but age regression has helped me to lessen the amount of physical harm I cause myself. I'm glad to hear that you found a coping mechanism that can help some! It can be hard to deal with trauma, especially childhood traumas, so it's important to find a coping skill that can help. I wish you all the best in your recovery! Oh, and in regards to not being able to use the coping skill because you're in highschool- I've heard that Tumblr and sometimes Pinterest have tips for being small secretly/discreetly!